NASA's Morpheus lander prototype in flames during a failed free flight test at the Kennedy Space Center in Cape Canaveral, Fla., on Aug. 9, 2012. HOUSTON — The NASA team behind a prototype moon lander that crashed in a test flight last month is pushing forward to build a new-and-improved replacement. The program, called Project Morpheus after the Greek god of dreams, is aimed at testing new technologies for a future planetary lander, including a novel propulsion system based on liquid oxygen and liquid methane fuels, which scientists say are cheaper and safer than traditional rocket fuels. A future version of Morpheus could be used to land payloads on the moon, Mars, or some other planetary body. 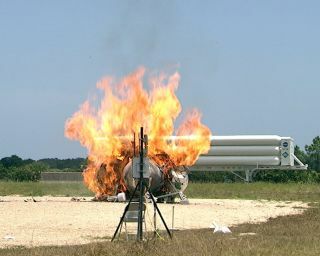 The first Morpheus prototype was destroyed by a fiery crash that ended its first untethered test flight Aug. 9 at NASA's Kennedy Space Center in Florida. The SUV-size lander had made it through 26 previous tests, though these had all been conducted with tethers attached to the vehicle for safety. This rough mockup of the Morpheus lander was made before the first vehicle was built. Project Morpheus is aimed at testing novel fuel systems and other new technologies for a future moon or planetary lander. Preliminary analysis suggests a problem with Morpheus' Inertial Measurement Unit — the system that determines the vehicle's attitude and speed — is to blame for the Aug. 9 failure. An avionics unit and cables being readied for a second Morpheus prototype moon lander to replace the first vehicle, which crashed during an August 2012 test flight. "We are focusing on the loss of data from our Inertial Measurement Unit," Olansen said. "Somewhere in that string we lost communication. It could have been anything from the unit itself to the wiring, the connectors in between, all the way to our avionics box." Without the data from the Inertial Measurement Unit, the vehicle couldn't determine how to control itself, so it would have issued commands based on its last known orientation and velocity. Given that failure, it was not surprising that Morpheus barely got off the ground before it crashed and burned, Olansen said. A full report on the cause of the failure is expected to be complete in about two weeks. Meanwhile, a replacement vehicle is being readied, and should be in place to begin test flights in January, Olansen said. These half spheres are fuel tanks being readied for the second prototype Morpheus lander, which should be ready for test flights in January 2013. "Most of the components are off at vendors right now being machined and welded," he said. "We're not making significant changes to the vehicle — some, to address the issues we saw, but nothing significant." One change will be to add backup systems for the Inertial Measurement Unit. The Morpheus lander is what NASA calls a "single-string" prototype, meaning it doesn't have redundant systems the way a spacecraft rated for flight would be. "If it were flying in space or if it were some other craft that was further along in its development cycle, you'd have redundancy built in," Olansen said. "To keep costs down and to make rapid progress, that’s not the situation we were in, we were single string." Olansen said he doesn't regret that fact, or the approach the team has taken. "Ever since the beginning, part of the whole strategy was spend less money in building up the craft so that you can work through failures," he said. "You don’t get to the point where the vehicle itself is too precious to actually test." The Morpheus team is a relatively lean group of 25 full-time members, and the project, based at Johnson Space Center, has cost NASA about $7 million over the last 2 1/2 years. Despite the disappointment of losing the first Morpheus, there was no question the project would continue, Olansen said. "The team is back up and on the horse and moving forward," he added.